New Capitol State Forest map is hot off the presses! Calling all Capitol Forest enthusiasts… the new Capitol State Forest map is here! The last edition was printed in 2002. What’s new in the 2013 edition? Plenty! More detailed maps of the Middle Waddell, Margaret McKenny, and Mima Falls areas. A ‘Recreation Fun Guide’ to get you started on a Capitol State Forest adventure…and much more! The new Capitol State Forest Map is now geo-referenced, making it ideal to download onto your smartphone. Photo: Diana Lofflin, DNR. Extra, Extra! 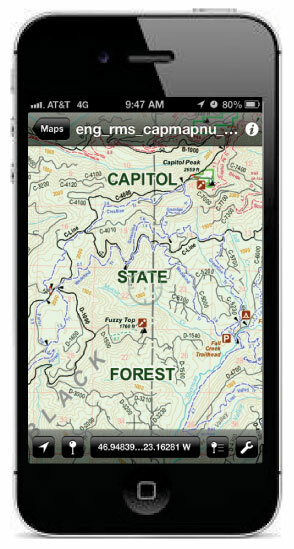 We now have a FREE downloadable Capitol State Forest map for your smartphone. Don’t forget your Discover Pass, your ticket to millions of acres of recreation opportunities on Washington state-managed recreation lands. The Discover Pass is now transferable between two vehicles.